Vancouver, BC, July 19, 2018 - Silver One Resources Inc. (TSXV: SVE; OTC Pink: SLVRF; FSE: BRK1 -“Silver One” or the”Company”) is pleased to announce that it has entered into a Lease/Purchase Agreement with Castelton Park LLC (“Castelton”) of Sparks, Nevada to acquire five patented claims constituting 83.5 acres (34 hectares) at its Cherokee project. Four of the patented claims for a total of 80 acres (32 hectares) cover the past-producing Cherokee vein system. These patents lie within the Company’s recently announced Cherokee claim holdings in Lincoln County located in eastern Nevada (see news release from July 9, 2018). Analytical results from select surface, dump, grab and chip samples, that are not necessarily representative of the mineralization hosted on the property, have returned values on the Patented Claims as high as 953.9 gm/t silver, 0.031 gm/t gold and 4.83% copper (see Figure 1. below). Select samples collected from a possible extension or splay to the Cherokee vein system, just the north of the Patented Claims, returned values as high as 765.4 g/t silver, 1.13 g/t gold and 0.02% Cu. (see Figure 1). The Cherokee property is a large underexplored project underlain by highly prospective geology with potential supported by historic mining efforts and recent surface sampling. 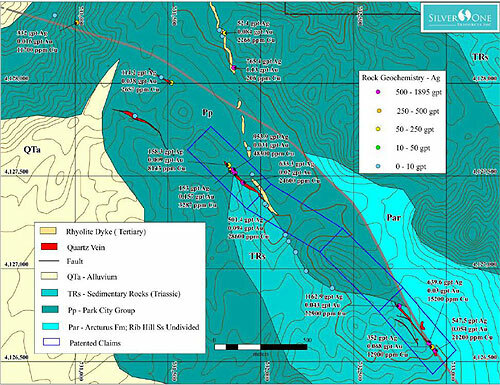 The property covers 636 lode claims comprised of approximately 13,000 acres (5,260 hectares), hosting a large structurally-controlled, epithermal silver-copper-gold system. Multiple veins, including Cherokee, Mojoto and Johnny (see Figure 2 below) occur within this structural corridor that has been traced for over 11 kilometers along strike (see Figure 2. below). The terms of the Lease/Purchase Agreement include three payments over a 2-year lease, consisting of a payment for US$23,125 upon execution of the agreement, US$34,688 on the first anniversary and US$34,687 on the second anniversary. This will provide Silver One with a 100%-interest in all patented claims. The Mill Claim, comprising 3.5 acres (1.4 hectares) and located 2.4 kilometres to the north of the Cherokee project, requires title verification before the final transfer to Silver One. The sum of US$10,000 will be withheld from the second anniversary payment until title transfer to Silver One is finalized. Castelton will also receive a payment of US$100,000 for every 7.5 million silver equivalent ounces of mineral resources calculated on the property, subject to a maximum of US$1,000,000. Cherokee is an emerging silver district located approximately 75 kilometres south of the historic Pioche mining camp. From 1869 to present, the Pioche area mined over 6 million tons producing in excess of 1 million ounces of gold, 20 million ounces of silver, 7 million pounds of copper, 350 million pounds of lead and 700 million pounds of zinc. Production was initially from gold-silver-copper veins and later from underlying carbonate-hosted replacement-type mineralized bodies. Mineralization at Cherokee is best characterized as epithermal in nature and is hosted in sedimentary and volcanic rocks, which is geologically similar to the past producing mineralized systems at Pioche. The figures below highlight the property location, the outlines of known veins and key silver, gold and copper sample results. Additional maps and photos can be found on the Silver One website at www.silverone.com. The samples were hand-delivered by Silver One personnel to the labs to ensure proper chain-of-custody procedures. The samples were assayed by Bureau Veritas (ISO 9001:2008) and American Assay Laboratories (ISO/IEC 17025:2005) located in Reno, Nevada. At the laboratory, the samples were dried, split and assayed. The samples were then analyzed for total gold by fire assay with an AA finish, silver by fire assay with a gravimetric finish and an aqua regia digestion-multi-element scan by ICP-ES. Over limits of silver and gold were further analyzed by fire assay-gravimetric using a 30-gram sample. Over limits of copper, lead and zinc were analyzed by AAS with aqua regia digestion. As part of the standard operating procedures, both labs also inserted certified blanks, standards and included duplicate analyses. 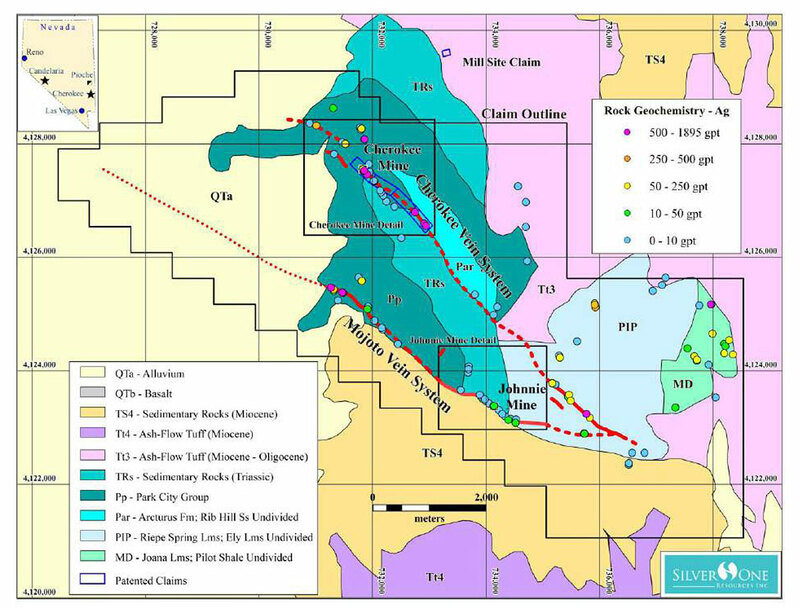 Silver One is a silver-focused exploration company that holds an option to acquire a 100%-interest in the past- producing Candelaria Silver Mine project, located in Nevada, from SSR Mining Inc. and a 100% interest in three significant silver assets located in Mexico: Peñasco Quemado in the State of Sonora, La Frazada in the State of Nayarit, and Pluton in the State of Durango acquired from First Mining Gold. As a result of these transactions, SSR Mining Inc. and First Mining Gold are key shareholders of Silver One. Information set forth in this news release contains forward-looking statements that are based on assumptions as of the date of this news release. These statements reflect management’s current estimates, beliefs, intentions and expectations. They are not guarantees of future performance. Silver One cautions that all forward-looking statements are inherently uncertain and that actual performance may be affected by a number of material factors, many of which are beyond Silver One’s control. 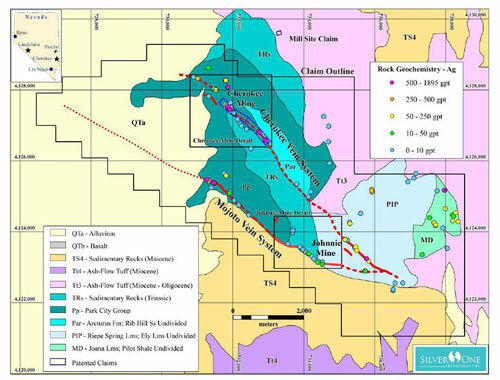 Such factors include, among other things: risks and uncertainties relating to Silver One’s limited operating history, ability to obtain sufficient financing to carry out its exploration and development objectives on the Candelaria Project, obtaining the necessary permits to carry out its activities and the need to comply with environmental and governmental regulations. Accordingly, actual and future events, conditions and results may differ materially from the estimates, beliefs, intentions and expectations expressed or implied in the forward-looking information. Except as required under applicable securities legislation, Silver One undertakes no obligation to publicly update or revise forward-looking information.